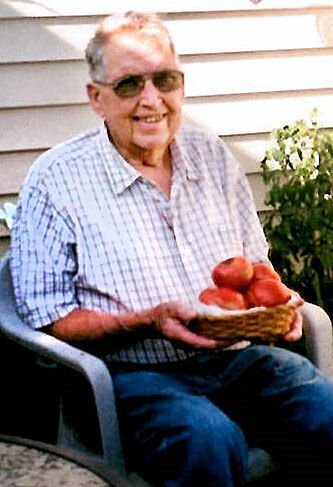 Robert Mason Miller (age 89) passed away peacefully on April 12, 2019 at Sacred Heart Hospital. He was born on June 14, 1929 to Fred and Freida Miller, and was brother to 12 siblings. At the age of 21, he married the love of his life, Edith Cropp, on August 4, 1950. Together they raised three daughters; Charlene Coss (Lowell), Roberta Bauer (Alphonse), and Pamela Kastner (Rich). Raising their family near the “Chippewa Bottoms” — off of Highway H — Robert worked as a millwright for Sterling Pulp and Paper (the paper mill located in Eau Claire) and retired to work personally under the mill’s owner, Walter Gold. From 1974 to 2012, Robert was the personal groundsman and greenskeeper for the Gold residence, attending to various projects: from gardening and landscaping to driving their dogs from Eau Claire to Arizona. Robert enjoyed his hobby farm, finding peace on his tractors (for the most part, always a John Deere) as he tilled the earth in preparation for soybeans, corn, or hay. Additionally, he reminisced frequently about his hunting trips out west or vacations he took with his wife and daughters. He loved his dogs, mostly Springer Spaniels by the names of “Yenta”, “Tanya”. A “heintz 57” mix (mostly Shepherd) named Brandy was a loved companion as well. Rumor had it he loved President Reagan so much, he named their family cat after him (close family members will note the sarcasm). In 2012, Robert (Bob) retired to be a full-time grandfather. From his daughters came forth Robert’s most precious assets — his beloved grandchildren. It was in these later years that Bob found his true calling in life: being grandpa. He was the grandfather that taught his grandsons to get up at 5:30 a.m. to tend to the farm (but only after listening to Bob Bosold). He was the grandfather that ensured his granddaughters received hugs and kisses at every visit. He was the grandfather that taught his grandsons to hunt each November — which according to some Norwegian ancient traditions (ok, kidding there) — also included learning to play cribbage and partaking in brandy slushes. He was the grandfather that attended basketball games, football games, and band concerts. Every grandchild knew they were going to win (or succeed) as long as they knew grandpa was there to cheer them on. He was the grandfather that would call your cell phone and sing you a song (on voicemail) to let you know he was thinking about you. He was the grandfather that sat every day with a grandson — waiting for the bus — teaching math, history, spelling and more. He was the grandfather that arranged for Santa Claus (in full garb) to visit each and every Christmas Eve so all the grandkids could meet Santa and receive gifts. He was the grandfather that hid Easter baskets (even at the top of grain elevators) so that he could delight in watching the great search. Additionally, he was the grandfather that put quarters in Easter eggs for the little tikes to scrounge for. He knew how to fix the perfect fire in his wood stove — and with that perfect fire came the smell of wild cherry tobacco — along with Bob waiting for you at the table (corncob pipe and all). At that moment in time, you knew you were in for a night of stories, a discussion about faith, or whoopin’ at a hand of cribbage. Sometimes all three. If it was one thing Robert knew how to be, we humbly put forth it was being the perfect grandfather. One would almost think he was destined for it. Or perhaps he used it as an opportunity to make up for parts of his past…? We’ll never know. His grandchildren all remain — Jeff, Chad, & Cheree (Coss) and Jerry and Valerie (Bauer). Great-grandchildren include: Brittney, Karl, Austin, Brandon, Logan, Colton, Broden, Dawson, Owen, Jackson and Grayson. One of the world’s greatest grandpas passed this week, which is how we’d like him to be cherished and remembered. Robert is survived by his wife of 68 years Edith, daughters Charlene, Roberta and Pamela, brothers Roger and Norman Miller, sisters Delores Kopp and Ivadell Howe, grandchildren and great-grandchildren. Funeral Services will be held at 11:00 AM on Wednesday, April 17th, 2019 at Lenmark-Gomsrud Linn Funeral & Cremation Services of Eau Claire, 814 First Avenue, Eau Claire, WI 54703. Visitation will take place at 9:00 AM at the funeral home until the time of service. Burial will take place at Spring Brook Cemetery. In lieu of flowers, memorials may be given to St. Jude’s Children’s Hospital. Lenmark-Gomsrud-Linn Funeral & Cremation Services is assisting the family. Online condolences may be shared at www.lenmarkfh.com.